European advocates of carbon capture and storage have become used to setbacks, for example the scrapping of the UK government’s much vaunted “£1 billion competition”, cancellation by Drax of the White Rose oxyfuel plant and the decision by Uniper and Engie not to continue with the ROAD project. But in recent weeks they have been able to point to a few positive signals, suggesting CCS might be “back on the table” as a decarbonisation strategy. The Dutch coalition government has, for example, talked about a key role for CCS and reaffirmed the potential benefits of a CCS cluster in the Port of Rotterdam region, while the UK government’s Clean Growth Strategy talks about deploying carbon capture, utilisation and storage (CCUS) “at scale”, with the formation of a new CCUS council. But perhaps the most significant development in recent weeks is the backing being given to CCUS by the Oil and Gas Climate Initiative (OGCI) and its investment arm, OGCI Climate Investments, a billion dollar investment fund that OGCI set up in 2016. OGCI (launched in 2014), is a CEO-led initiative with the backing of ten of the world’s largest oil and gas companies, which has identified accelerating deployment of CCUS as one of its key goals, and is in a position to support CCUS development with what might be called “real money”. The gas-fuelled-power-plant-with-CCS project continues a programme initiated by the UK Energy Technologies Institute (which is in the process of being wound down, as planned, after ten years). In 2016 the Energy Technologies Institute announced it was launching a £650 000 project to develop an outline gas power plant design with carbon capture, identify potential sites and “build a credible cost base for such a scheme”. SNC-Lavalin was appointed to the project to produce “a generic business case for developing a gas-fired power plant fitted with carbon capture and storage”, working with AECOM and the University of Sheffield’s Energy 2050 Institute. The ETI’s whole energy system modelling work (employing its ESME model) has consistently shown that CCS is one of the most cost effective technologies for achieving carbon dioxide reduction targets. In the UK case not having CCS doubles the cost of meeting 2050 targets. Back in June 2015 the ETI had launched a request for proposals for a Thermal Power with CCS (TPwCCS) project, which aimed to accelerate the development of a low cost, low risk ‘Phase 2’ CCS project, which could follow on from the then government-backed ‘Phase 1’ CCS commercialisation competition projects. Following the UK government’s decision not to proceed with the competition the ETI reshaped the TPwCCS project to reflect the new circumstances. The reshaped project focused on large scale (up to about 3 GW) natural gas fuelled combined cycle with post combustion capture, with the aim of developing what it calls a ‘template’ power plant design, identifying potential sites in key UK industrial hubs and building a “credible cost base for such a scheme, benchmarked as far as possible against actual project data and as-built plant.” The results of this exercise are due to published shortly. In parallel with this work on a generic design of combined cycle plant with carbon capture, early stage preparatory work, building on the generic work, was also undertaken by ETI on what is described as an “actual plant”. This activity, the Clean Gas Project, has now been transferred to OGCI Climate Investment, along with “critical ETI background knowledge”, and, as already noted, has been selected as one of OGCI Climate Investment’s initial projects. 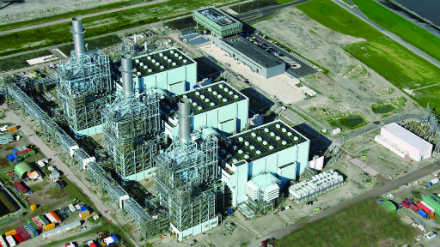 Interestingly, another CCS project in Europe that could be described as still active, with feasibility studies ongoing, is the proposal to convert one of the three 440 MWe blocks of Vattenfall Nuon’s Magnum combined cycle plant in the Netherlands (pictured below) to run on hydrogen produced from natural gas with a byproduct of CO2. Statoil, Vattenfall and Gasunie are working on feasibility studies, with a final investment decision possible in 2019. The technology for producing hydrogen by converting natural gas into hydrogen and CO2 is well established, usually by steam–methane reforming, where methane reacts with steam in the presence of a catalyst to produce hydrogen, carbon monoxide, and a relatively small amount of carbon dioxide. A “water-gas shift reaction” is then typically employed in which the carbon monoxide and steam are reacted using a catalyst to produce carbon dioxide and more hydrogen, followed by “pressure- swing adsorption”, in which carbon dioxide and other impurities are removed from the gas stream, leaving essentially pure hydrogen. The proposed Magnum scheme would appear similar to BP’s Peterhead pre-combustion CCS project in the UK, which was cancelled in 2007.